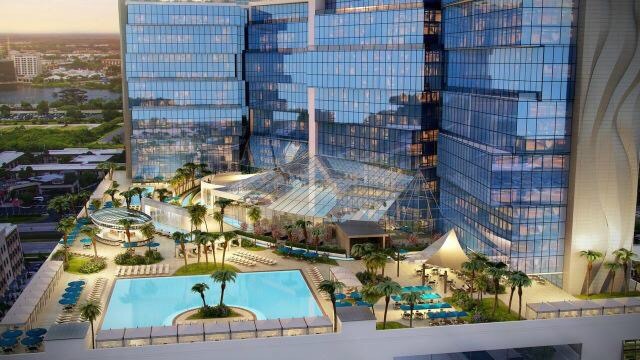 The last few months seem to have been very quiet on the latest development to hit International Drive, Isquare Mall + Hotel, but judging by the new renderings it has been very busy behind the scenes. Developer Abdul Mathin, chairman and CEO of Orlando-based international real estate firm The Blackmine Group, shared new images of the Las Vegas-style multilevel mall and 27-story hotel he plans to break ground on next year in Orlando’s International Drive tourist corridor. Mathin said “the development team is working on construction documents and is targeting March to submit those plans to the city of Orlando for approval”. The planned “seven-star” 729-room hotel has an agreement with United Kingdom luxury spa company Espa to manage and operate a 25,000-square-foot, on-property facility, Mathin said. Espa has two existing Florida in-hotel spas in Sunny Isles Beach and Miami’s Mandarin Oriental resort, and just debuted a new one at The Joule hotel in Dallas. iSquare Mall + Hotel’s planned “seven-star” status is expected to come from the resort’s extraordinary amenities.